When pears are in season, no matter what variety they are, it is hard to pass them by at the market or when walking down the fruit aisle at the store. They may even call out to you, with their soft skin and even juicier flesh, the ripest of the ripe, the sweetest of the sweet. Anjou pears have a mild flavor with a firm texture, and are great for slicing, or grating, into any cooked dishes or salads. Asian pears are crispier, crunchier, and more fitting for eating raw or delicately diced in a pear salad, they also taste amazing in tarts and pear crisps. And never forget the Bartletts, or Williams Pear, perhaps the juiciest of all – they will fall apart when cooked, but if that is part of the plan, then embrace the pear jam. 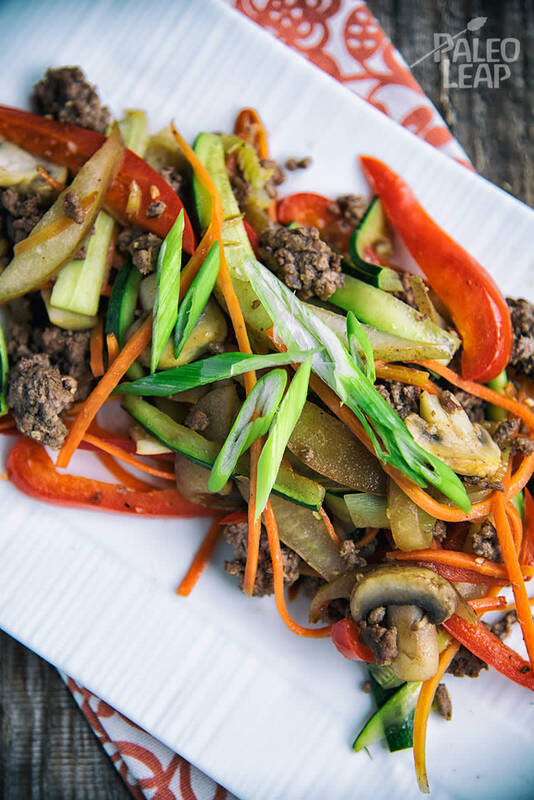 What is simply wonderful about this pear and bell pepper stir-fry with ground beef (pork or ground chicken can be substituted with amazing results), is that the ingredients are so basic and down to earth, that you will feel as though you are close to nature, in the most Paleo sense of the meal. Add a little fire to your sliced ingredients and transcend time and space to indulge in a meal that could span centuries. Getting closer to reality, this meal is perfect for a weeknight feast, complete with almond and grape stuffed pears as a sublime dessert. Melt some cooking fat in a skillet over medium-high heat. Add the garlic and ginger, then cook until soft and fragrant, about 1 to 2 minutes. Brown the ground beef until no longer pink, 4 to 5 minutes. Drain some of the fat, if desired, and add all the remaining ingredients except for the beef stock. Cook until the vegetables are nearly soft, with just a hint of crunchiness. Pour in the beef stock, and cook until reduced by half. Serve topped with green onions.